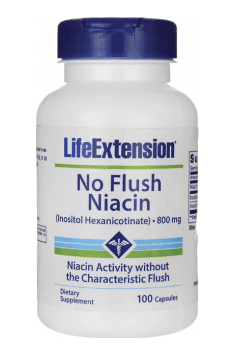 Life Extension No Flush Niacin is a dietary supplement with an optimum dose of vitamin B3 in the form of inositol hexanicotinate, i.e. without “flush effect”. Inositol hexanicotinate is an increasingly popular, unique form of vitamin B3. It is hydrolised in the body into nicotinic acid and inositol. It is released longer that standard forms of niacin and consequently works more effectively and does not cause side effects called “niacin flush” (the so-called flush effect or flushing). “Flushing” is a characteristic response of the body to a standard form of niacin, manifested by a sudden hot feeling, reddening, tingling and itching, mainly on the face, shoulders and chest. The symptoms disappear rather quickly and do not risk your health but many individuals consider them very troublesome and unpleasant. We can avoid such discomfort by choosing niacin in the form of inositol hexanicotinate. Vitamin B3 (vitamin PP, niacin) — is a term used to name two different compounds: niacin (nicotinic acid) and nicotinamide (nicotinic acid amide). It is one of the most vital B vitamins to the body. It is synthesised from tryptophan, but often in very small amounts that do not meet the body’s requirements. Up to 300 biochemical reactions in the body are dependent from niacin. It is a part of key coenzymes (NAD and NADP) which are responsible for cellular oxidation and contribute to the metabolism of proteins, fats and carbohydrates. It is necessary for the development and functioning of the whole body. Niacin is essential for the normal functioning of the nervous system. It is a important part of the treatment of mental disorders and schizophrenia. Its great role in treating depression is being discussed more and more often. Vitamin B3 deficiency is often manifested by disorders of the nervous system – anxiety, insomnia and malaise. Niacin is involved in the synthesis of serotonin – the most important neurotransmitter which is responsible for a positive mood and normal cognitive functions. Morevover, it prevents sleep disorders, has sedative properties and stabilises the whole nervous system. Niacin prevents strokes, heart attacks and cardiovascular diseases. It eliminates their main cause, namely abnormalities in lipid parameters. It lowers the levels of triglycerides and low-density lipoproteins (LDL) which tend to deposit in the arteries and clog their lumina. It also boosts the levels of the beneficial LDL cholesterol. From all vitamin B3 forms, inositol hexanicotinate shows the strongest anticholesterol properties. It is released and absorbed gradually and that is why it does not overload the liver. In large therapeutic doses, it is a crucial element of the prevention of atherosclerosis and cardiovascular diseases. Niacin is necessary for the proper metabolism and is involved in the production of cellular energy. It is an important constituent of key enzymes in cellular respiration – NAD and NADP. Vitamin B3 deficiency is therefore often accompanied by weakness and lack of vitality. As a donor and acceptor of of hydrogen ions, niacin is essential for the majority of biochemical reactions, including the metabolism of proteins, fats and carbohydrates. Too low niacin intake can cause digestive disorders, especially in the stomach and intestines. Niacin has antifungal properties comparable to popular drugs. It prevents the development of yeast and fungi, including Candida albicans strains and Ascomycota by blocking the enzyme necessary for their growth – deacethylase Hst3p. It does not cause any side effects. Niacin helps cleanse the body of toxins and harmful substances. It aids in removing heavy metals from the body, reduces harmful effects of chemical compounds and drugs. It improves the metabolism of ethyl alcohol, protecting liver cells against its toxicity and overload of the liver. Because the conversion of tryptophan into vitamin B is hindered due to the action of estrogens, women of reproductive age must ensure to provide the proper niacin supply. What is more, this vitamin brings many benefits to the women’s body – it balances estrogen and progesteron levels which consequently helps regulate the menstrual cycle; relieves menstrual pains. Niacin has a positive effect on beauty – maintains the normal structure of the skin and hair. It improves the skin tone, eliminates redness and roughness of the skin. It inhibits excessive hair loss and gets rid off severe dandruff. To sum up, No Flush Niacin is a perfect way to correct vitamin B3 deficiency. The product is recommended for individuals struggling to balance properly their diet and provide an optimum vitamin intake from food. It is also indicated for people drinking too much alcohol in whom niacin deficiency is very common. The properly selected dose and form of niacin ensure excellent bioavailability and exclude the risk of side effects such as ”niacin flush”. No Flush Niacin 800mg 100 caps. The supplement contains an optimum dose of niacin. This form of vitamin prevents flushing. Vitamin B3 dissolves in water, but it should not be taken on an empty stomach. It is recommended to use the supplement during a meal. It is worth noting that coffee and tea contain substances that can block niacin absorption and that is why capsules should not be taken with these liquids. An extract from Masson’s pine bark. It has positive influence on the circulatory system. Supplement containing glucosamine and vitamin C. It facilitates rebuild cartilage and regeneration.